What is a Heat Pump? A heat pump is an air conditioner that works normally when you need to cool your home. Then, it works in reverse when you need to warm your home. Technically speaking, it removes heat from your home as refrigerant is forced to evaporate inside a copper coil. Nothing is worse than your heat pump breaking down in the peak of the summer or freezing over in the dead cold of winter. Obviously, a new heat pump is the most reliable. However, if a new heat pump is not what you are seeking, our expert services a variety of brands to keep your running all the time. An efficient heat pump means money in your pocket. A new heat pump is packed with modern technology and is always more efficient than an older ones. New technology includes variable speed fans, two stage condensers, and fantastic thermostats. 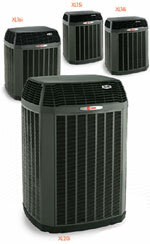 We sell Trane heat pumps of all sizes. What is your best selling heat pump? The Xli Family is our #1 best seller. These heat pumps are designed to deliver the reliable, energy-efficient heating and cooling you expect from Trane. Each unit is designed and engineered to meet rigid specifications, tested to ensure excellent performance, and manufactured to last through the years. With the Trane Xli heat pump, you can feel confident in your investment and comfortable in your home all season long. Comfort Link™ II technology allows the main components of your system to communicate with each other for more reliable performance throughout the life of your investment. Charge Assist™ charging features provides automatic and accurate charging, which enhances the reliability and efficiency of your home-comfort system. With a Seasonal Energy Efficiency Ratio of up to 19.0 and a Heating Seasonal Performance Factor of up to 9.0, the Xli Family delivers all-season comfort while keeping your energy costs down. These systems also offer dual Climatuff ® Compressors. This offers efficient, cost effective, two stage cooling, Best-in-the industry design also provides superior durability, quiet operation and enhanced comfort. Call us to find out more information on the top of the line systems. You depend on your gas furnace to keep our family warm and comfortable. That’s why we sell and install Trane 95 gas furnace. The Trane 95 gas furnace operates quietly and reliably as possible. These units are Energy Star ® qualified and enables 96.7% of the fuel you pay for to be converted directly into usable heat for your home. In addition, the Trane 95 gas furnaces feature ComfortLink™ II communicating technology, connecting all for the key systems components and enabling remote telephone access. Imagine converting 95.0% of your fuel into heat which would arm your home more cost effectively. These systems also work in the simmer time with your air conditioner and cooling coil to distribute cool air and dehumidify your home. One of the most special facts about the Trane 95 gas furnaces is that is features a variable-speed blower motor with Comfort-R™. This means that is operates on a lower, more efficient speeds than conventional blower motors and provides greater humidity control during cooling. Oil Furnaces are your dependable comfort for the entire winter season. The Trane 80 family ensure durability and reliability to ensure maximum comfort with high AFUE(Annual Fuel Utilization Efficiency). The result-80% of the fuel you pay for is actually converted into heat for your home. So you get warm, comfortable air even when the weather is brutally cold. 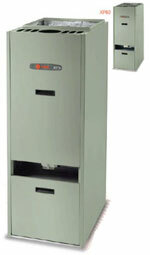 The Trane 80 oil furnaces convert 80% of your fuel into heat, warming your home more cost effectively. They feature a variable-speed blower motor and Comfort-R™ for even heating, enhances comfort and utility savings. The Trane oil furnaces work even in the summer with your single-stage or two-stage air conditioner to distribute cool air and dehumidify your home with our exclusive Comfort-R™ mode. 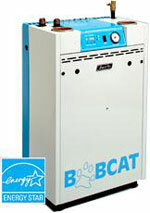 The Bobcat High Performance Condensing Gas Boiler is beautifully designed for better performance, smoother installation and the ultimate in application versatility. Just as stop and go driving wastes fuel, so does on and off cycling of your boiler. On very cold days your boiler may operate continuously to heat your home. However, on warmer days, an ordinary boiler with unchanging output will repeatedly turn its burner on and off. This puts out lots of BTUs for short periods of time, wasting fuel with every new ignition. On warmer days, the Bobcat automatically reduces its BTU input using a proper lower level of fuel consumption. This reduces cycling dramatically. In addition, the heat exchanger enters the condensing mode. Here, the Bobcat maximizes heat extraction from the combustion process and significantly reduces your fuel bills. The lightweight Bobcat boiler is designed for easy handling and speedy installation. The shipping crate lifts right off and built-in lifting ports on the boiler assist in moving it from skid to floor or wall mount location. Other Bobcat boiler features include top connections for water, gas, vent and electric. PVC, CPVC or stainless steel pipe can be used for intake and exhaust. 100 feet of equivalent length pipe can be used, allows you to install boiler almost anywhere. Quick seal vent pipe connections ensure easy positive seal. Discover why electric radiant floor heat may be just what you need for your home. By having electric radiant floor heat you can create warm tile in your bathrooms, kitchen, basement, or anywhere in your home. Electric radiant floor heating is by far more efficient way to warm tiles than any other electric floor heating systems. It is a myth that electric heated floors will increase your energy bill. Unlike forced air systems, radiant floor heating systems do not waste heat being forced through the ducts or by heating the ceiling. 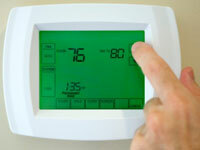 You will feel warmer with electric floor heating and you can set your thermostat at a lower temperature. By having radiant floor heat anywhere in your home will reduce energy costs up to 40%. You will enjoy the luxury of warm tile and floors anywhere in your home. One of the accessories that we offer for your heating and air conditioning that you may not have thought about is a touch screen programmable thermostat. These thermostats are easy to use as well as easy to read. They provide an aesthetically pleasing look, and accurately set the temperature control based on your preference. With energy costs rising, it is good to know that there are some powerful and relatively inexpensive solutions out there so save energy and money. To find out more information on any of these systems please contact us. The federal government is offering tax credits for consumers on existing homes including water heaters and air conditioners. Contact us to find out more. Set the water heater temperature at 120 degrees - about halfway between low and medium. This will help save energy and prevent scalding, while keeping unhealthy bacteria from growing.